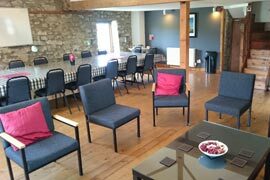 Wharfedale Lodge offers Group, Family and Business Hire and has now changed its name from The Confluence Centre to reflect the recent refurbishment to our facilities. 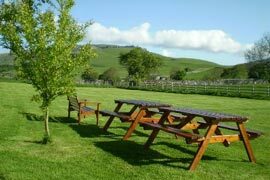 Wharfedale Lodge is a beautifully converted barn situated in picturesque Upper Wharfedale near to the famous Kilnsey Crag and between the pretty villages of Grassington and Kettlewell. The building is surrounded by sheep grazed pastures and is within 500 metres of two rivers, waterfalls, springs and wildflower meadows. (This was the location for the 'Calendar Girls' film). The centre has two hotel standard lounges - one in the 260 year old main barn which is full of character and original features. The second luxuriously furnished with leather armchairs, dark wood tables and all mod cons including tv, cd, dvd, video, drinks area and snooker table. There are many walks locally, including the Dales Way which runs past the centre. Popular walks include Kilnsey to Malham, Kettlewell, Grassington and Arncliffe. Riverside walks can be taken between Kettlewell and Buckden, Grassington to Burnsall and Arncliffe to Hawkswick.